This cornbread quick bread has just the right balance between heat and sweet. The buttermilk creates a moist texture while the jalapeños offer a little kick. There is also no baking powder, which will often leave an aftertaste. Perfect as an accompaniment to homemade chili, on the buffet table at the backyard barbecue, or surprise your Thanksgiving guests by adding it to the bread basket. Preheat oven to 375 F. Grease an 8-inch square pan or baking dish. In a large mixing bowl, whisk together the melted butter and sugar. Add the eggs and whisk until combined. Add the buttermilk and baking soda, and whisk to combine. Add the flour, cornmeal, jalapeño peppers, and salt. Using a spatula, stir until just blended. Do not over mix. Bake for 35 minutes, or until a toothpick inserted in the center comes out clean. Let cool for at least 15 minutes before trying to cut. The perfect cornbread is moist on the inside with a nice outer crust. To achieve this combination, you need to be sure to include the right type of ingredients. First, you want to use a finely ground cornmeal vs. a more coarse ground. This will create a light texture. It's also important to use full-fat buttermilk to impart a rich, tangy flavor. This recipe calls for using an 8-inch square pan, but you can also bake the cornbread in a cast iron skillet. This type of pan will create a crispy outside and more of it since the surface area is larger. Keep in mind the bread will be thinner, but if you love the crunchy part, it will definitely satisfy. Grease the skillet as you would the pan. If you happen to have any leftover, cornbread can be used in a variety of ways. Cut it into cubes and make it the base for a stuffing, delicious inside a pork loin or as a non-traditional holiday side dish. It can also be sliced thinly and used as the bread for a sandwich, such as ham and cheese with pickled jalapeños. A few days old cornbread is perfect for making croutons which are delicious sprinkled on a warm bowl of chili or atop a Southwestern-style salad. If you don't like jalapeños, feel free to leave them out and this recipe will still come out ​delicious. 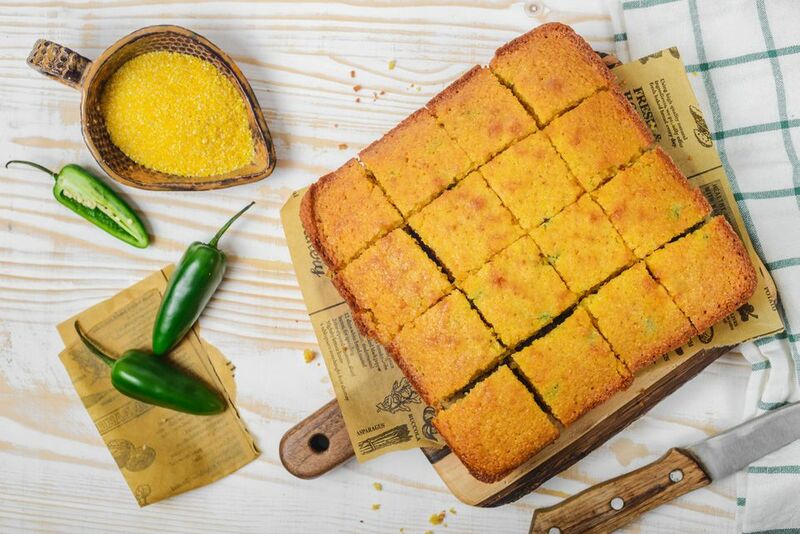 In addition to the jalapeño (or in place of), you can add fresh or frozen corn kernels, cheddar cheese, or all three, to make your own Mexican cornbread.